Hit some ice under snow – time to dig! If you into multi-sports, then going on holiday is always hard to decide what gear comes and what stays. 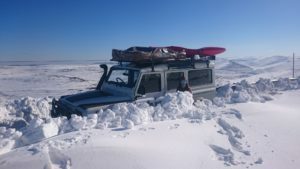 Fortunately with a Defender you can fit in a lot, so another epic adventure was at hand. As usual I like doing things on impulse and nothing was planned, so my wife and I just packed up and left. First up was Clarens since there was a whitewater festival happening on the Ash river. 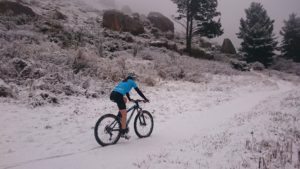 Arriving in Clarens in the evening, we realised due to all the snow in the Drakensberg the place was fully booked. This at least made things interesting finding a place to sleep last minute. I was rooting to just park of next to the river somewhere and sleep in our rooftop tent – unfortunately we found a place – my wife was happy! 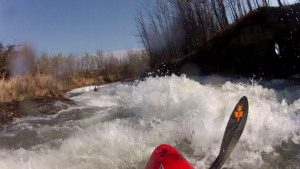 It’s always nice kayaking a new river and I had a good time trying out some slalom, something I have not done before. The best part about these festivals are meeting other like minded people and forming new relationships. Was especially cool meeting a few RAW heroes. Clarens is a really cool town to visit and has a lot to offer. I was just happy to find a coffee roastery and local craft brewery, which sold the place to me. Clarens also plays host to a big MTB event every year with some great singletrack. With all the kayaking I only ended up going for one ride in the surroundings of Clarens but Shauna made up for my part and got in some good riding. The morning after the kayak festival we woke up to a snow filled Clarens, not something that happens a often. Was really a cool atmosphere around town, did not feel like I was on the African continent at all. 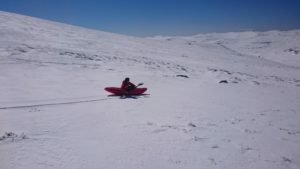 Snow kayaking – fun, until the walk back up! Lesotho was next up and we entered at Caledon’s poort border post close to Foeriesburg. As we were driving along we asked locals and officials if the roads were open since we knew about the big snow storms earlier the week and that the mountains have been covered by thick snow for more than a week. All replied – yes !!! Little did we know what awaited us. As we climbed up into the mountains the snow became more. 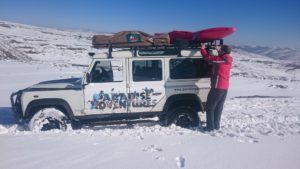 The road had been mostly cleared of snow up until Afriski, but after this things became interesting. I searched for a good slope to kayak and ended up with a good workout above 3000m in altitude, pulling the kayak back up the slope. Shauna only just visible above the wall of snow. The driving became really fun from here but very tricky on ice and in thick snow. Just passing the diamond mines, one could see no more trace of any vehicle tracks. I scouted a bit and could see there was only a short section where the snow was deep on the road and after that it looked ok as far as I could see. (Well so I thought) As I got into the deep snow the 4×4 went through onto the ice below and just stayed put spinning. Fortunately I had a spade and started digging and breaking ice. Shauna enjoyed the view and snapped pictures happily through all this. Once through this section and over another hill we came across the guys from the diamond mine with graders opening the roads. There was no going on, we waited behind the graders but as one thought the road was getting better around the next corner it would again have a wall of snow blown over the road. Even the grader was having a hard time clearing. It was getting late in the afternoon and roads were starting to ice up again so we had to decide quickly on plan of action. We could park of here in the middle of no where and pitch the tent (fortunately had all our camping gear and supplies) or we could drive back and stay over at Afriski. My wife won and we headed back to Afriski. They had backpacker accommodation open which I would not recommend. We had a steak in the cooler box, so I made a fire in the snow and had my coldest braai to date in negative degrees celsius. Not even the coles lasted long in the cold – fortunately rare works for me and we had a good pinotage on hand. The next morning we had to wait for the Landy to unfreeze before it would start. We then drove back to where we were the previous day to find the grader still busy clearing. 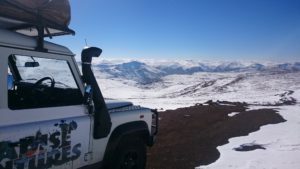 A local told us about another dirt road not on my map, that would take us on a detour but eventually bring us out close to Sani pass our intended destination. He said their was not as much snow on that side of the mountains. I started down this dirt road pass but soon realised if I continue down I would get stuck and not even be able to get back up due to gradient and thick snow. So it was back to waiting for the grader. Chatting with guys opening the road it was sad to hear how many dead bodies they find when opening the roads, often inside cars that got caught in the storm. People don’t always realise how important it is to have the right gear for these environments. While waiting I found a hill to navigate up with the 4×4 and make a well deserved espresso on top! Not long after we came across the Lesotho army which meant we could not be to far from through, since they had come from the other side. As the grader pushed away the last wall of snow we went past and started down the mountain. We even passed huge trucks stuck in the snow. 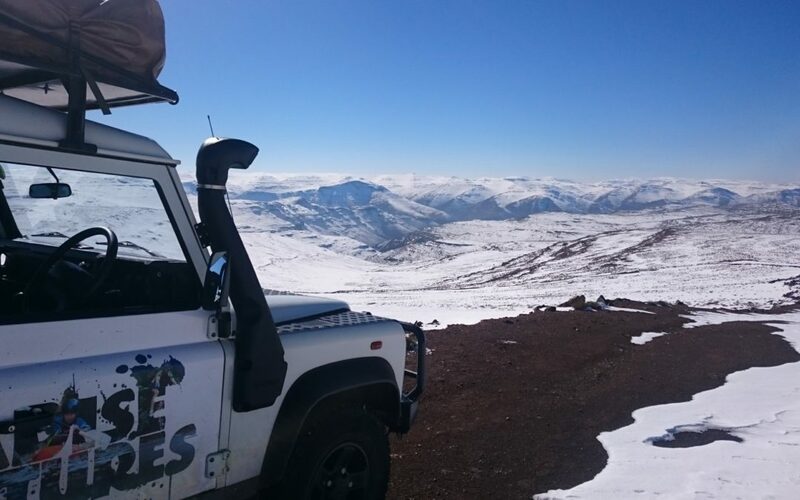 As we went down into the valleys the snow disappeared, at this stage it was a relieve, we should be making the border post at Sani pass today. Going up again to Sani pass we re-entered the snow but it was nothing like what we came through, suddenly their were also other vehicles and people again. Mostly tour operators showing people Sani pass and having a drink at the highest pub in Africa. Sani pass down (steeper than expected) and onto Underberg for us, another cool spot worth a visit! 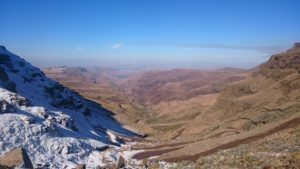 Underberg is situated on the foothills of the Drakensberg and allows for some good Mountainbiking in the surroundings. We spent the next few days exploring by bike and enjoyed some good trails at Sani Spoors. They offer some nice singeltrack routes and the best coffee in the southern berg! Really nice little restaurant and facilities where all the trails start and finish. The higher we went up the more snow and ice materialised – gloves would have been great at this point. 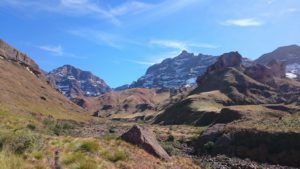 Then it was time for a 3day backpacking trip in the Drakensberg’s Garden Castle area. The Drakensberg has since childhood been one of my favourite destinations. With some nice warm days it seemed like most of the snow had already melted from afar. 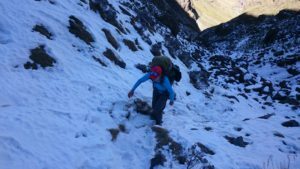 When we started climbing up towards Rhino Peak however we realised there was still a good amount of snow in the higher passes. With heavy laden bags the climb was quite tricky trying to avoid stepping on ice and finding soft snow instead. Getting to the top the wind was freezing cold and pumping so hard it would rip a tent apart. Fortunately a little overhang was at hand in which our tent fitted perfectly. An early supper was had before we left to summit Rhino Peak in the late afternoon and catch the sunset from there. 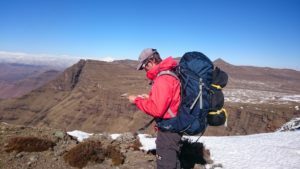 The second day was spent traversing the escarpment and finding our intended pass to go down – Mzimude pass. 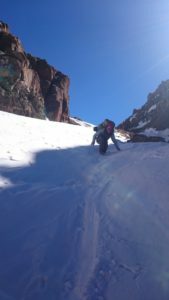 It was solid hard pack snow from side to side. How I wished I had an ice axe to make things easier. It took ages to get down the steep slope making steps as I went. No one had been down here since the storms. At one stage I took a slip and had an awesome but scary slide down until I hit a patch of soft snow. Made up some good distance at least. All turned out well and we spent a nice cold night in the valley at -15degrees. The next morning all was frozen even the tent was solid ice. We had to give the sun some time to unfreeze our shoes before we could put them on. Walking out along a river we decided it was time for a swim in the icy water. Was a good way to end the trip and the holiday. Time spent in the mountains is where I go to recharge my batteries, there is just nothing like it! 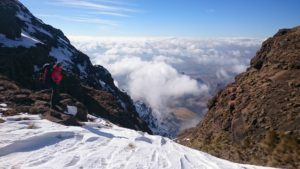 If you have not visited the Drakensberg, do yourself a favour and make plans to, it is such a vast wilderness area where you can do endless exploring by whatever means you choose. 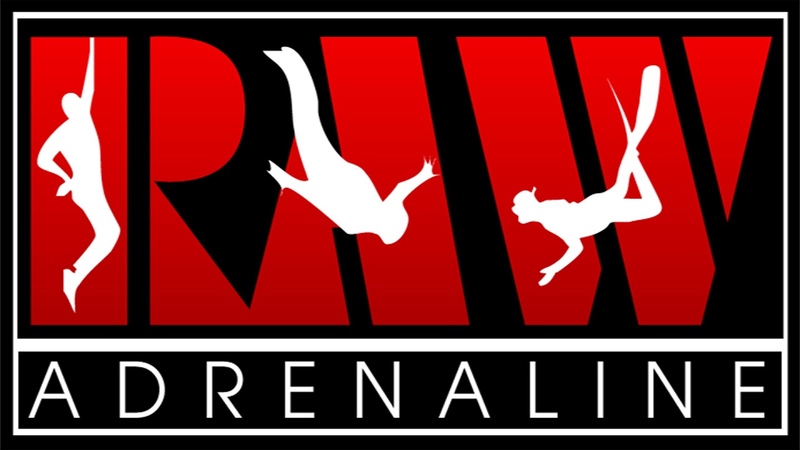 It offers the ideal place for altitude training in multiple sporting disciplines. But always make sure you have gear for all conditions, the weather can change in an instant any time of year! Even if you just going for a trail run or day hike take some emergency gear with. 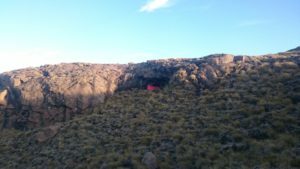 It can safe your live when things go wrong – it is a wilderness area !! !